"Next life, trail runner. One pair of shoes. Maybe one of those water-bottle holder fanny packs," Eszter Horanyi, talented endurance mountain biker, adventurer and skier extraordinaire, musing on the paradox of gear geekery. I like to say it was the inspiration of the Swan Crest 100 that did it — but really, it was the frustration of TransRockies. With a mountain bike dangling precariously on my shoulder and my legs buried to my knees in mud, I resolved then and there to take up trail running. The mountain bike stage race in the Canadian Rockies last August was a ton of fun, but after four and a half hours of dragging the bike through foul-smelling, cow-stomped sludge to gain a mere 25 kilometers of ground, I had an epiphany: I carried this bike over mountain passes. I carried this bike down headwalls. I carried this bike across rivers and up impossibly steep trails. I carried this bike through a seemingly endless bog of mud. This race would be a whole lot easier without this bike. I love riding bikes. I like the flow of smooth trails, the quickness of pavement, the crunch of gravel, the challenge of climbs and the exhilaration of descents. But there are times that bikes feel like anchors — riddled with mechanicals, demanding endless maintenance, clogged with mud, limited by skill and strength and the restrictions of wheels. During the Bear 100, Beat asked me about the farthest distance I had traveled on foot in one day. I started to cite my Grand Canyon hikes, at 26 miles, but stopped myself when I remembered the Iditarod. “I pushed my bike over Rainy Pass,” I said. “About 50 miles in the deep snow. It took me 27 hours.” And the whole time I was dragging that heavy, suddenly useless anchor. I had this fantasy about being free from all of it — free from gear, free from responsibility, free from expensive and highly breakable bike parts, free from trail restrictions and rules, free to just lace up a simple pair of shoes, fill a simple bottle with clear stream water, and just run. There would be nothing to break down, nothing to maintain, nothing to hoist over awkward obstacles, no restricting myself to staying within the lines if I didn’t feel like it. There would just be me, running up the mountains, down the mountains, wherever I felt like running. Free. And then I entered the Susitna 100. I couldn’t have picked a more gear-intensive trail run. Sleeping bag. Bivy. Closed-cell foam mattress. Down coat. Wind shell. Fleece socks. Gortex shoes. Hydration vest. Sled. And on and on. The list is quite long. When I throw it all together, it’s downright shocking. I scour my list for things to cross off, but I can’t. I need it, I tell myself. All of it. The other day, Beat accused me of being a gear junkie, because I always manage to choose the most gear-intensive versions of the outdoor sports I enjoy. I had to concede. Once, way back in a far-away but simpler life, I was just a hiker. I owned one pair of hiking boots. Then I started multiday hiking with grotesquely heavy loads of camping gear on my back. Then I got a road bike, panniers and a bunch of extra gear so I could go road touring, followed by yet more bikes and yet more gear for mountain biking, working my way up to the most heavily laden of them all, snow bike touring, along with snowshoeing and mountaineering … then GPS units, small and large backpacks, bike bags, poles, crampons, ice ax, clothing layers, coats, mittens, shells, socks, more socks, boots, trail-running shoes, more shoes, and finally all of this Susitna 100 crap. And deep down, I am grateful for everything my gear has enabled me to do. It’s opened my freedom of exploration to realms I could have never dreamed to venture otherwise. 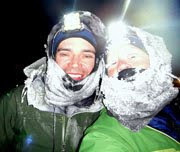 Traveling 350 miles across Southcentral Alaska, over the Alaska Range and into the Interior in February? I wouldn’t have survived a night without my gear. 2,780 miles from Banff to Mexico in 24 days? I certainly needed my bike to help with that. Running the Susitna 100? I can’t wait for that challenge. If I need the stuff in my sled, so be it. But in my next life, I’m going to be a barefoot runner in the Montana mountains. One water bottle. Huckleberries for food. Maybe some bug spray. Either way, life is good. I really like your pictures Jill, tough sometimes to get a good night-shot. Stripping running to the essentials-that's an adventure. I love every piece of my gear. During my last move I got rid of everything unnecessary but even my pared down collection of bikes/skis/toys is daunting. But I figure that if I use it all on a regular basis, then it's worth having. I'm learning to embrace it. I think. at 55 with an arthritic big toe that won't bend combined with a bunion, Achilles tendon won't heal from an alumni basketball game last spring and knowing that even as healthy 25 year old I sucked at running, I'm sure glad that mtn. bikes and xc-skis have come a long way. But, I sure agree that less is more at times, and more times than not. Yeah, nice post, and introspection. I run a bit overloaded compared to someone like Anton Krupicka, who brings, shoes, shirt, shorts, gels, s-caps and one water bottle on a 60-mile fun run. However I do really like the tricky task of doing as much as you can with as little as possible. Enough to be safe, but no more than that. I actually tend to shy away from things that involve a lot of gear. Then again like you said, you've had a bunch of great adventures with... stuff. And if you don't use the necessary gear, you lose out on that. You know, if you run fast enough you don't need bug spray. Good luck at the Su100! You see, I was foxed by the fact that you only have your tights for running and have not yet acquired a pair of rediculously skimpy shorts. Gear is good. Especially if you use it. I'm still in the "gear" stage...I practically drooled reading your list of gear for the Su. And I almost laughed out loud at your list of "regular food"!!! 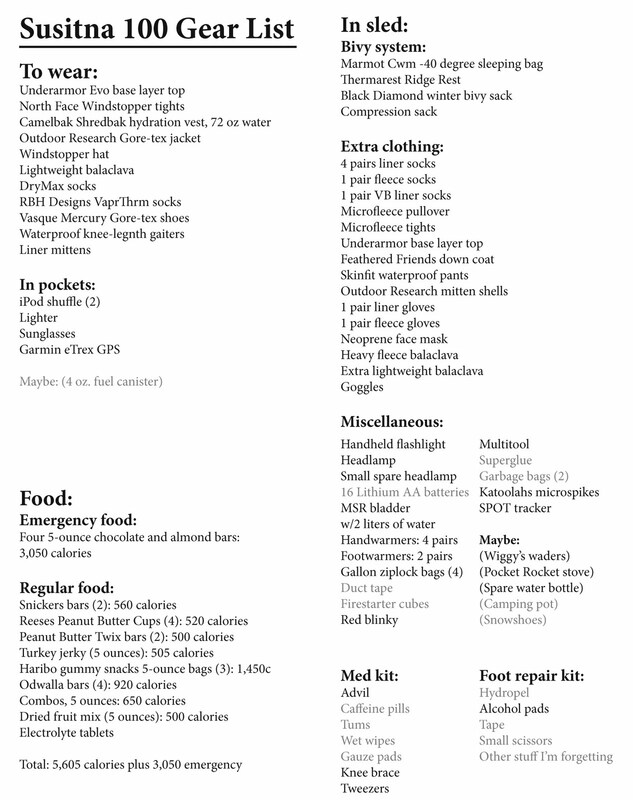 That food list has been honed over five years of bonking because I couldn't choke down my whatever performance or "healthy" food I was carrying, and only slightly modified for running. I take what I know I'll eat, because any calories are better than no calories. I lived for 24 days on candy during the Tour Divide. I figured I can survive 48 hours in the Su. Thanks for sharing all the valuable info Jill. I'm always interested in seeing what others are doing with gear and food selection. There can be a pretty steep learning curve especially with the winter activities. I'm still working on clothing selection and I'm especially concerned about keeping my feet warm on the bike in the winter. I would love to tackle Arrowhead 135 next year, but still have a lot of learning to do and I'm not getting any younger. Any further advice you could give me would be most appreciated. I also meant to say that to do what you are doing and have done you have to be a gear junkie. I can't believe the stuff I've accumulated over the years :) How many hydration packs and backpacks does a person need? And... I second the jerky on the food list; I actually snack on it on long runs. Especially since unlike you I don't like the sweet stuff, and for whatever reason jerky (beef in my case) is easy on my stomach. I think the salt may help too. As a cyclist and paddler I've always been jealous of 'runners'. The ability to just 'put on shoes' and run. That's about as free as you can get. Great, but don't give up the cycling please. You are are unlikely to have a next life. Do it what you want now instead of looking for excuses. Great stuff! I love reading your posts! They are totally adventurous! Full of thrills and spills! the quote at the beginning of the article is wrongheaded...but your point is well taken and in science that kind of simplification is known by the term Occam`s Razor. Came across your site, after viewing Geoff Roes. Great site & info! I have a friend that will be riding the Susitna 100 and his girlfriend will be running the 50k. I went ahead and forward your site to him. You never know, maybe something on your list, will trigger something they didn't think about? Though I didn't do extreme distances back then, some of the same feelings about gear and maintenance led me to trail running from mt. biking a little over a decade ago. Su has me wondering about my "simpler" sport these days. 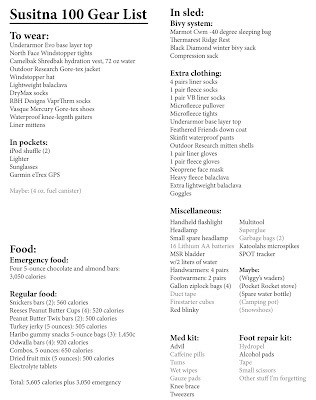 Of course, after reading your gear (and food) list, I do still think I am over-packed. We'll see in a few days! Gear junkies...just ignore what others nmay say about your amount of gear...My bike number equals my pairs of snowshoes (9).Response I get a lot of "you have 9 pairs of snowshoes ! WHY?" My answer is to take others out in winter to places they can't even dream about...yet. I'm still dreaming about the 10th bike.